Allie, Yin Mom, Yang Mom, is our co-host for April. If you haven’t already stopped by Allie’s blog, Yin Mom, Yang Mom, then do it.. do it now. Allie and her sister, Mere, blog about a wide variety of subjects. From family, house keeping, crafts, and a lot of favourite recipes too! Subscribe to your host and co-host via the links above. If you’d like, you can also follow us on our social networking links too. Thanks for the party. Have a good one! Thanks for another fantastic party! Have a great week! 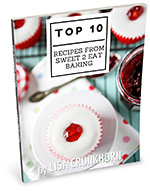 Thank you so much Lisa for featuring my Strawberry muffins. Have a great day! Thanks for hosting the Linky party and inviting me! Thanks for hosting. Hope you can bring something over to What’d You Do This Weekend? at Tumbleweed Contessa’s kitchen. Oh yay thanks for featuring my Strawberries and Crunch Cream Parfait! I want every single one of those features 🙂 Have a great week! Thank you so much for the feature, and for hosting a fantastic party as always. I can’t wait to see what is linked up this week.